The law of supply is the economic law that states “With other constant factors, the volume of the offer increases as the price of the good increases”. The increase in the supply with an increase in the product’s price depends on the circumstance when the profit grows with the increase in price and with fixed costs per unit of the product. In this case, the producer (seller) makes profit selling more goods. The real picture on the market is more complicated than this simple scheme, but the expressed tendency makes sense in real life. The supply curve shows the relationship between market prices and the quantity of goods that the producers want to offer. 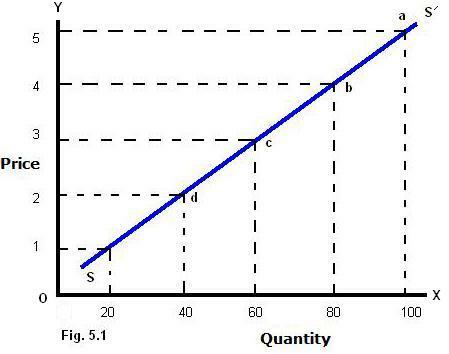 The main factor affecting the motion of the supply curve is the cost of production. The firms produce goods to get profit. For example, farms grow wheat. They grow more wheat because currently wheat is more profitable to sell than other crops. And vice versa. The second factor that influences the motion of the supply curve is a technological progress. New seed material, more efficient machines, modern computer crop rotation program – all this allows the farmer to reduce the production costs and change the supply of his goods. The production costs are a key element of the long-term action on the “supply curve”.